Hi everyone!!! another busy week. hopefully things will slow down a bit, so I can get caught up! I bought 1 yard of fabric this week. not sure where the yardage for what I bought is. I will have to find it! My biggest accomplishment for this week is, the quilt that my mother made is FINISHED! yeah!!!! it finished at 101 x 102. we used 17 yards from stash. oh yeah! Mom started this last summer. 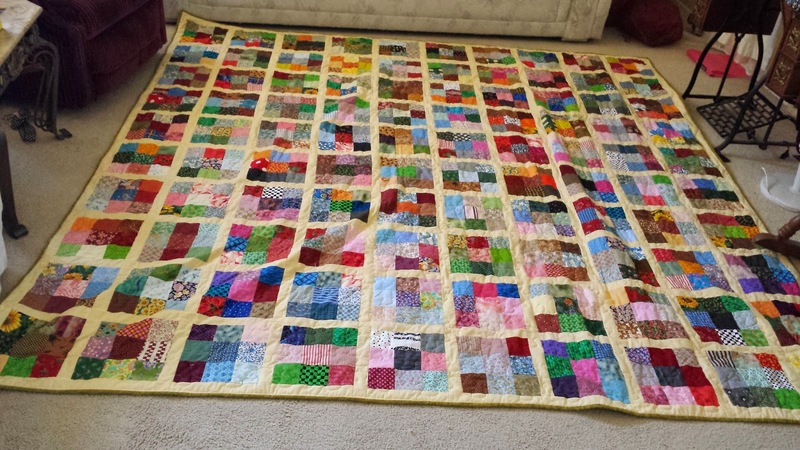 all the squares were precut from my scraps. I love using up my scraps. I think mom is giving this one to my sister. lucky gal! Mom did a great job. I did the binding for her. Didn't she do a great job! She is working on 2 quilts tops now. 2! Amazing!!! I finished another swap of apple blocks, no pictures. 16 blocks. Oh, and I have 4 rows of 17 done on my large tumbler 30s quilt. Vicki's is finished! a while ago. like maybe last year...... no picture yet. I promise one next week. Yes, I think it is beautiful! Oh this quilt is GORGEOUS!!!!! So awesome you and your mom are doing them together!!!!! !